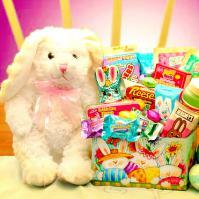 Send chocolate Easter gift baskets and Easter gifts to children by mail with free shipping. 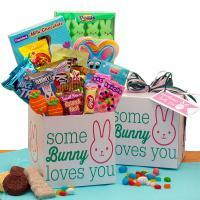 Buy Easter gift baskets for kids including Easter candy baskets, Easter bunnies, and toys. 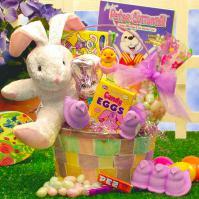 Find Easter gift ideas to delight any child, grandchildren, family member or friend. Easter is the most significant day in the Christian calendar and is celebrated in many different ways with a variety of customs and traditions. People may be surprised to discover that some of these observances predate Christianity, and were originally intended to celebrate the arrival of spring. Historians tell us that the holiday was named for Eostre, the ancient Anglo-Saxon goddess of spring. The month we now call April was named after her, and the Christian holiday that was observed around that time became known as ÏEasterÓ in English-speaking countries. During the second century A.D., missionaries who sought to convert the tribes living in northern Europe discovered that the holiday commemorating JesusÌ resurrection seemed to dovetail with the yearly Teutonic celebrations, which also stressed the renewal of life. The egg has symbolized fertility and new life since the dawn of history. The Romans, Egyptians, and PersiansÛalong with other ancient societiesÛused eggs in the celebration of their spring festivals. In the Middle Ages, Christians were not allowed to eat eggs during the penitential season of Lent, and the eggs that were preserved during those 40 days became an essential part of the Easter meal. They also became a gift that was prized by both servants and children. Greek Orthodox Christians painted their eggs a bright red, symbolizing the blood Christ shed on Good Friday. In Armenia, eggs were drained of their contents and decorated with various religious figures, while Germans hung them on trees and gave green eggs as gifts on Holy Thursday. Austrians covered them with tiny plants before boiling them, which created a white pattern when they were removed. In Ukraine and Poland, the traditions were particularly elaborate, and people often painted their eggs gold and silver. A sanky egg involved the careful application of wax patterns on an egg. After the egg was dyed, wax was reapplied to preserve the original color, and the process was repeatedÛresulting in a multi-color patterned or striped egg. Today, coloring Easter eggs is a longstanding tradition, and they are usually painted, dyed, or decorated, in any number of ways. Over the years, they became part of various holiday games, and parents hid eggs for the childrenÌs Easter egg hunt. Egg-rolling contests were also held, including the one on the White House lawn that is featured in the news each year. The rabbit has also long been regarded as a symbol of fertility. 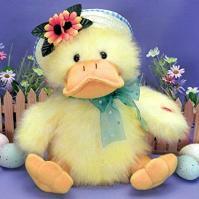 In Germany, children were told stories about an ÏEaster hareÓ that would lay eggs for them to find. When Germans immigrated to the United States, they continued the tradition, began baking Easter cakes in the shape of rabbits, and may have originated the idea of making chocolate Easter eggs and bunnies. When they were baptized, the early Christians wore white robes throughout Easter week as a sign of the new life they had begun. Those who were already baptized did the same as a symbol of the life they shared with their Savior. Robed in white, Christians would take a stroll after participating in the Easter Mass. Someone carrying either the Easter candle or a crucifix led the procession. This has evolved into our modern Easter parade, where people wear their Easter finery and the Easter bonnet is celebrated in song. Easter Decorating Tips and Ideas - Sure you decorate your fireplace and mantel for the winter holidays, but donÌt forget this important focal point in your room as Spring approaches. Click here for some nearly-instant decorating ideas for springtime and Easter fireplace.